Based on the information that has so far been provided to the public, I conclude that Donald Trump is an Article II "natural born Citizen" but Barack Obama is not. Putative President Barrack Obama might also run for re-election in 2012. While our legal and political institutions have allowed Obama to escape having to prove that he is a “natural born Citizen,” he will not be able to do the same when running for re-election in 2012. Hence, the question still remains whether Obama is a “natural born Citizen.” As I have stated repeatedly in the past, I cannot conclude that Obama is a “natural born Citizen.” Obama fails to meet the “natural born Citizen” eligibility test because when he was born in 1961 (wherever that may be), he was not born to a United States citizen father and mother. Why spend so much private and public money and resources fighting the same issue over and over again? Even now, over two years after the 2008 election, we see the same place of birth issue raised in various contexts. It has risen in the military context with LTC Terry Lakin, who is serving 6 months in federal prison for defending the Constitution by wanting to assure that Obama is a “natural born Citizen.” We see it in ObamaCare litigation. Now some states are also moving to require proof of birth as part of a presidential candidate's requirements to get on the ballot. Officials with the National Conference of State Legislatures report that 10 states already have some sort of requirement to prove eligibility. There is Arizona's H.B. 2177 and S.B. 1157, Connecticut's SB391, Georgia's HB37, Indiana's SB114, Maine's LD34, Missouri's HB283, Montana's HB205, Nebraska's LB654, Oklahoma's SB91, SB384 and SB540, and Texas; HB295 and HB529. With Texas' 34 votes, these states possess 107 Electoral College votes. http://www.wnd.com/index.php?fa=PAGE.printable&pageId=258585 . Hawaii Governor Abercrombie has recently revived the birth place issue, vowing to find the birth certificate and put an end to the debate. But we have seen that he found no birth certificate. Now Donald Trump has publicly announced that Obama should do the right and simple thing and just release his long form, hospital generated birth certificate. So, there is no end to the issue of Obama’s place of birth. Should we not blame Obama himself for this issue still existing? After all, the Constitution says that he must be a “natural born Citizen.” Is not the burden on him to satisfy that requirement? The question of where Obama was born is not a distraction, for it only takes 10 minutes and $10.00 to resolve (the amount of time and money needed to produce his real birth certificate). But apart from the place of birth issue, we also have the question of whether Obama is an Article II "natural born Citizen." Assuming that he was born in Hawaii and also assuming that his parents are who he says they are, does Obama meet the definition of an Article II "natural born Citizen?" At his birth, his mother was a United States citizen. But under the British Nationality Act of 1948, his father, who was born in the British colony of Kenya, was born a Citizen of the United Kingdom and Colonies (CUKC) which under that same law and by descent made Obama himself a CUKC. Prior to Obama’s birth, Obama’s father neither intended to nor did he become a United States citizen. Being temporarily in the United States only for purpose of study and with the intent to return to Kenya, his father did not intend to nor did he become even a legal resident or immigrant to the United States. Obama may be a plain born “citizen of the United States” under the 14th Amendment or a Congressional Act (if he was born in Hawaii). But he is not an Article II "natural born Citizen," for upon Obama's birth his father was a British subject and Obama himself by descent was also the same. Hence, Obama was born subject to a foreign power. Obama lacks the birth status of natural sole and absolute allegiance and loyalty to the United States which only the President and Commander in Chief of the Military and Vice President must have at the time of birth. Being born subject to a foreign power, he lacks sole allegiance and unity of citizenship to the United States from the time of birth which assures that required degree of natural sole and absolute birth allegiance and loyalty to the United States from birth, a trait that is constitutionally indispensable in a President and Commander in Chief of the Military. Like a naturalized citizen, who despite taking an oath later in life to having sole allegiance to the United States cannot be President because of being born subject to a foreign power, Obama too cannot be President. The Founders and Framers understood that under natural law and the law of nations, as explained by Emer de Vattel in his, The Law of Nations, Or, Principles of the Law of Nature (London 1797) (1st ed. Neuchatel 1758), a nation’s most fundamental duty is self-preservation. They therefore included the "natural born Citizen" clause in the Constitution so that each and every citizen would be protected by having someone assume and exercise the great and singular civil and military powers of the President and Commander in Chief with only their and the nation's values and safety at heart. To accomplish that end, the Founders and Framers required that anyone born after the adoption of the Constitution be born in the United States to U.S. citizen parents. We have seen with the many Obama eligibility law suits filed in our federal courts, citizens have attempted to protect themselves by enforcing the “natural born Citizen” clause. One of these law suits is Kerchner v. Obama, 612 F.3d 204, 2010 U.S. App. LEXIS 13608 , cert. denied, 131 S.Ct. 663 (2010). In these legal actions, the federal courts have simply denied anyone the right to enforce the “natural born Citizen” clause and to challenge Obama’s eligibility because as they have said, no one had standing to bring any such lawsuits. Generally, one has standing to bring a legal action if one can show that one has suffered an injury in fact caused by the defendant’s conduct and for which the court can give one a remedy. Several of our states are now working on drafting and passing presidential vetting and eligibility election statutes. As one example, Arizona H.B. 2177 and S.B. 1157 both have standing clauses. These clauses state: "A member of the House of Representatives, a member of the Senate or any other citizen of this state has standing to initiate an action to enforce this section." As we can see, unlike our judicial branch of government, Arizona legislators have rightfully recognized the right of a citizen to protect his or her life, liberty, safety, security, tranquility, and property from a potentially illegal President sitting in the Office of President and Commander in Chief from which he or she would wield enormous power over that individual which would cause that person an injury in fact on a daily basis. If one of these state laws passes, such a citizen would have standing to file a legal action in which he or she would be able to enforce the "natural born Citizen" clause by enforcing the state eligibility statute. As I have already stated in my article entitled, “The States Have a Right and Duty to Assure Their Citizens That a Presidential Candidate Is an Article II ‘Natural Born Citizen,’” the states have every right and duty to pass presidential vetting and eligibility legislation. To give these laws any teeth and to avoid any possible political games by any Secretary of State, it is critical that such legislation include a standing clause. Without Congress, the courts, the political parties, and the media willing to enforce the “natural born Citizen” clause, how else are responsible Americans to make sure that their President is eligible for that office? Let us all give our states the support they need to enact such necessary and proper legislation. Atty Mario Apuzzo and CDR Charles Kerchner (Ret) were on the Peter Boyle Radio Show on KHOW 630 in Denver CO - Monday 28 March 2011 @ 8 a.m. EST. The topic will be the lack of constitutional eligibility of the putative president Obama and Obama's unwillingness to provide any hard evidence and documents to controlling legal authorities to back up his claim of a Hawaiian birth. Also, Donald Trump's recent statement calling on Obama to release his alleged long form birth certificate, if Obama has one. Factual and legal issues will be discussed. Obama was born to a British Subject foreign national father and Obama himself was thus a British Subject at birth. Obama is not a "natural born Citizen" as is required by the U.S. Constitution Article II, Section 1 for that reason since his father was not a U.S. Citizen, not even an immigrant to the USA, nor even a permanent resident. Obama's birth may have been registered in Hawaii but with the contrary statements coming out of Kenya, and in past years before he ran for President such as these, it is likely that he was not physically born in Hawaii but only falsely registered there as being born in Hawaii by his maternal grandmother after the fact to get her new foreign born grandson U.S. Citizenship using a simple mail-in form available back in Hawaii in 1961. The false registration of his birth would account for the short-form certification of live birth record and the 1961 newspaper accounts of the birth being registered with the Hawaiian Health Department which placed those public service announcements in the weekly papers for all birth registered, real or falsified. See Atty Mario Apuzzo's "Catalog of Evidence" for and against Obama's claimed Hawaiian birth nativity story. Atty Mario Apuzzo and CDR Charles Kerchner (Ret) were on the Les Naiman radio show, WGTK 970 in Louisville KY, hosted by Les Naiman, on Sunday, 27 March 2011 at 6 p.m. EST. The subject will be the Obama eligibility issue and the recent statements by Donald Trump that Obama must release his long form birth certificate, if there is one in Hawaii. 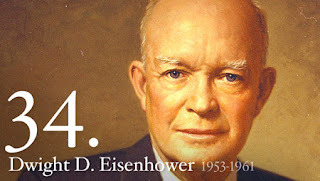 President Dwight Eisenhower Had to File a Birth Certificate to Run for President - Unlike Obama, Ike had nothing to hide! 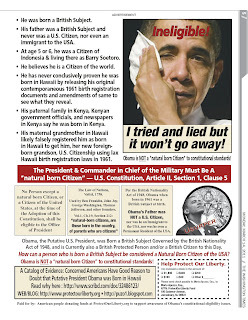 BY LINDA BENTLEY - CAVE CREEK – Glen Fairclough, a reader from Salt Lake City, Utah, sent us an e-mail last week to express his gratitude for publishing the recent article regarding President Obama’s Kenyan birth certificate. Read rest of the story via the link and for further information about Ike's proven natural born Citizenship status upon his birth in Texas in Oct 1890 to two U.S.
citizen parents, unlike Obama who claims he was born in Hawaii but whose father was a foreign national and was not even an immigrant to the USA. And also unlike Ike, Obama has relatives, African newspapers, and government officials in Kenya saying he was born there and not in the USA. Ike never had relatives and government officials in foreign countries stating repeatedly that he was born in their country. Thus, the logical justification to ask to see Obama's original long form birth registration documents in Hawaii, and any amendments to same. This is logically needed to verify that he indeed was physically born there and not just had a false birth registration done in Hawaii via sworn affidavit of a birth at home with no independent witnesses and submitted by mail by his maternal grandmother who lived there in order to get U.S. Citizenship for her foreign born grandson. Birth registration fraud was easy in Hawaii in 1961 due to the very lax laws in the new state. May We See Your Real Birth Certificate, Mr. President? WND in its recent story, Why Short Forms Fall Short, states that Washington D.C. and Virginia Passport Offices do not accept short-form birth certificates as acceptable items of proof of identify, but Hawaii does. Joseph Farah reports: “I recently conducted a little experiment. I called three passport offices with the following apocryphal tale: I said I needed to apply for a passport but only had a short-form certification of live birth from Hawaii. Would that suffice? The three passport offices I contacted were in Hawaii, Washington, D.C., and Virginia. “As of October 30, 2010 the United States Department of State does not accept Puerto Rican birth certificates issued prior to July 1, 2010 as primary proof of citizenship for a U.S. passport. So, as we can see, birth certificates by themselves are not necessarily reliable pieces of evidence of where someone was born. That someone is registered as born in a certain place does not necessarily mean that the person was in fact born there. It is the corroborating information that is stated in the certificates or any other supporting evidence that gives one any reasonable degree of assurance that the birth event occurred as is represented in the document. 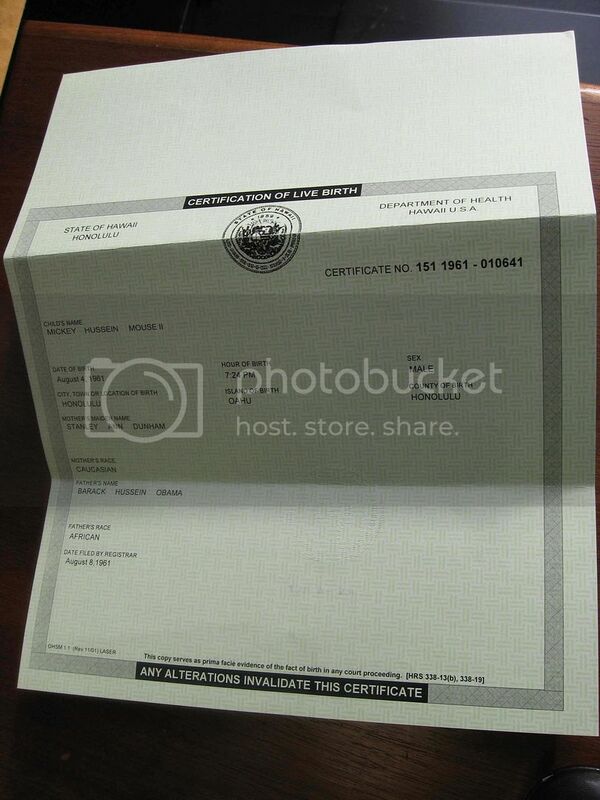 As the only proof of his birth place, Obama has presented a 2008 computer image (not a piece of paper) of an alleged 2007 Certification of Live Birth (COLB), which is a short-form birth certificate and not a long-form, hospital generated birth certificate. This computer image does not include the name of the birth hospital or the name and signature of the delivery doctor or of any other witness to the birth. The Hawaii Department of Health has publicly stated that Obama was born in Hawaii. But we have not seen any evidence to support their assertion. Even the two newspaper announcements of his birth in Hawaii are nothing more than a repeat of what someone allegedly told the Hawaii Department of Health in 1961 regarding Obama’s alleged birth in Hawaii. On the contrary, there is much evidence putting into serious doubt Obama’s claim that he was born in Hawaii. 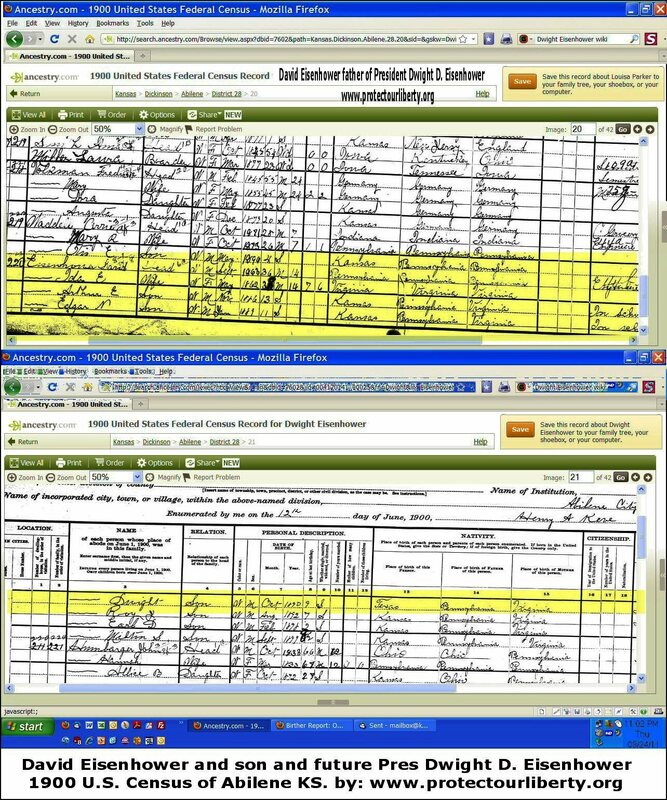 See this evidence at, A Catalog of Evidence - Concerned Americans Have Good Reason to Doubt that Putative President Obama Was Born in Hawaii, http://puzo1.blogspot.com/2010/05/catalog-of-evidence-concerned-americans.html. Additionally, on July 4, 2010, Lucas Smith provided each member of Congress with his or her own personal copy of the Coast Province General Hospital Kenya Birth Certificate, bearing Certificate No. 32018, which shows that Obama was born on August 4, 1961, at the Coast Province General Hospital in “Mombasa. British Protectorate of Kenya.” On March 12, 2011, Mr. Smith called into the Hagmann-McLeod Report on CFP Radio, a radio show on which Commander Charles Kerchner and I were guests. I directly asked Mr. Smith if he is willing to testify under oath and under penalty of perjury before Congress as to how he obtained this birth certificate. He said that he has always been ready to do so. One may listen to the show via podcast at: http://www.blogtalkradio.com/cfp-radio/2011/03/13/hagmann-mcleod-report . Despite all this, Congress has not asked for any investigation into the authenticity of the Lucas Smith birth certificate. Nor has this Kenyan birth certificate yet been proven to be a forgery. Obama’s short-form birth certificate, which states that it is only prima facie evidence of place of birth, is not only unreliable, but fails to adequately prove Obama’s place of birth in light of all this other conflicting evidence. Evidently, Obama’s internet-posted COLB has not convinced a great majority of Americans. A new poll and survey shows that 91% of Americans doubt Obama is constitutionally eligible to be President. In other words, only 9% believe Obama has adequately documented his eligibility to be President. See the recent WND story by Bob Unruh, entitled, “Shocking scientific poll on Obama's eligibility” at http://www.wnd.com/index.php?fa=PAGE.printable&pageId=276865. Obama is not only applying for a passport. Rather, he wants to be President and Commander in Chief of the United States. Is it not past time that Obama produce to the American people his certified long-form, hospital generated birth certificate from Hawaii or some other evidence showing that he and his mother, Stanley Ann Dunham, were patients on August 4, 1961 in the hospital in which he claims he was born, Kapi’olani Maternity & Gynecological Hospital, now called Kapi’olani Medical Center for Women & Children? 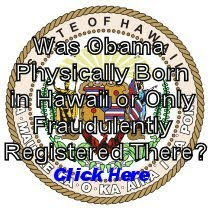 Is it not also past time that Congress honestly and thoroughly investigate Obama’s claim that he was born in Hawaii so that we can finally put this pesky issue to rest? Or are the powers that be expecting that Obama will not run for re-election in 2012? Finally, if Congress is not going to honor its constitutional duty to protect the American people and the Constitution, than it is up to the States to do so. 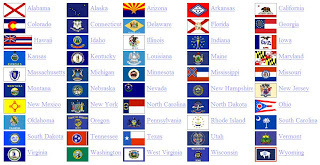 On the States’ constitutional power and duty to address presidential eligibility requirements, see “The States Have the Constitutional Power to Pass Legislation Prescribing Presidential Ballot Access Requirements Including Determining Whether a Candidate Meets the Eligibility Requirements of Article II, Section 1, Clause 5", at http://puzo1.blogspot.com/2011/03/states-have-constitutional-power-to.html . BREAKING NEWS: Arizona House Government Committee Votes 5 to 1 Tonight to Approve a Presidential Eligibility Bill as Part of Renewed Effort in AZ to Get Into Law Measures to Vet the "natural born Citizen" Status and Require Birth Certificate Documents and Constitutional Eligibility of All Presidential and Vice-Presidential in 2012 and All Future Elections. I just received a phone call from a person attending the AZ House Government Committee meeting tonight. They voted 5 to 1 on Senate Bill 1157 to move it out of committee to a full AZ House vote. The equivalent Senate Committee tomorrow morning will vote on a similar House initiated bill to get, if passed by that committee, a full Senate vote. Such a bill would protect Article II, Section 1 of our U.S. Constitution and the Citizens of Arizona from usurpation of that clause in our U.S. Constitution. Congress has failed to act on protecting the Presidential Eligibility clause in Article II, Section 1. So the states must do this to protect the Constitution and our Constitutional Republic. We are a nation of laws and the Constitution is the fundamental law of the land. We the People acting through our several states will not allow usurpation and ignoring of our constitution. If the requisite bill is passed by both chambers in AZ it would then move to the Governor for signing into law. More information will be forth coming and we will post it in the comments for this thread as we learn it. “Independent News & Media PLC [INM] is a leading international newspaper and communications group, with its main interests in Australia, India, Ireland, New Zealand, South Africa and the United Kingdom. Spanning four continents, 10 major markets and 22 individual countries, INM has market-leading newspaper positions in Australia (regional), India, Indonesia, Ireland, New Zealand and South Africa. In the United Kingdom, it publishes the flagship national title, The Independent, as well as being the largest newspaper group in Northern Ireland. "THE people of Moneygall can expect more than the usual madness when President Barack Obama swings by in May -- specifically lots of snooping and sniping from supporters of the "birther" movement, an ardent group of radicals who claim Obama is not a natural-born US citizen -- and thus has no legitimate claim on the Oval Office. Obama, who has been knocking down claims that he was really born in Kenya and/or that he is a Muslim and/or a British subject since the start of his campaign, recently stirred the pot when he started making fun of the president wasn't-born-here crusade. Last weekend, at the Gridiron Club dinner, Obama had everyone in stitches when he instructed the band to play Bruce Springsteen's Born in the USA instead of Hail to the Chief. And last Thursday, when the president addressed guests at the St Patrick's Day lunch on Capitol Hill, he went out of his way to tease those who "are still bent on peddling rumours about my origins", before putting his Moneygall ancestry squarely in play. "Today, I want to put all those rumours to rest," he laughed. "It is true my great-great-great-grandfather really was from Ireland. It's true. Moneygall, to be precise. I can't believe I have to keep pointing this out." But Obama might be forced to change the tenor of his tune by the time he hits Offaly. Last Thursday, potential 2012 presidential candidate Donald Trump amped up the conspiracy theories saying he finds it "strange" that nobody knew Obama as a child in Hawaii. "He grew up and nobody knew him. You know? When you interview people, if ever I got the nomination, if I ever decide to run, you may go back and interview people from my kindergarten. They'll remember me," Trump said on Good Morning America. "Nobody ever comes forward. Nobody knows who he his until later in his life. It's very strange. The whole thing is very strange." Now let us examine just what is wrong with this insidious article. 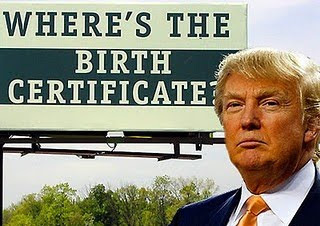 Just what may a “birther” be? A “birther” is a person who wants to see our Constitution’s Article II, Section 1, Clause 5 “natural born Citizen” clause respected and protected by our nation. It was the fear of foreign influence invading the Office of Commander in Chief of the military that prompted John Jay, our first U.S. Supreme Court Chief Justice, to write to George Washington the following letter dated July 25, 1787: “Permit me to hint, whether it would be wise and seasonable to provide ‘a strong check’ to the admission of Foreigners into the administration of our national Government; and to declare expressly that the Commander in Chief of the American army shall not be given to nor devolve on, any but a natural born Citizen (underlying "born" in the original). Jay’s recommendation did make it into the Constitution. Article II, Section 1, Clause 5 of the Constitution provides in pertinent part: “No person except a natural born Citizen, or a Citizen of the United States, at the time of the Adoption of this Constitution, shall be eligible to the Office of President. . .” In this clause and in Articles I, III, and IV, the Founding Fathers distinguished between "Citizen of the United States" and "natural born Citizen." Per the Founders, while Senators and Representatives can be just “Citizens of the United States,” the President must be a "natural born Citizen." The Founders and Framers put their ultimate trust in “the Laws of Nature and of Nature’s God” and not in the laws of mankind and human political and legal institutions. The Declaration of Independence, preamble. The “natural born Citizen” clause is a manifestation of this trust. Through this clause, the Founders sought to guarantee that the ideals for which they fought would be faithfully preserved for future generations of Americans. The Founders wanted to assure that the Office of President and Commander in Chief of the Military, a non-collegial and unique and powerful civil and military position, was free of all foreign influence and that its holder has from birth sole and absolute allegiance, loyalty, and attachment to the United States. Indeed, the Founders and Framers demanded that a would-be President, born after the adoption of the Constitution, be born with sole allegiance to and unity of citizenship in the United States. The “natural born Citizen” clause was the best way for them to assure this birth circumstance. The Venus, 12 U.S. (8 Cranch) 253, 289 (1814): Chief Justice John Marshall, concurring and dissenting for other reasons, cited Vattel and provided his definition of natural born citizens. Inglis v. Sailors’ Snug Harbor, 28 U.S. 99, 3 Pet. 99, 7 L.Ed. 617 (1830): the Court, which included Chief Justice John Marshall, held that a child born after July 4, 1776, in New York to British subjects was himself a British subject. Minor v. Happersett, 88 U.S. 162, 167-68 (1875): Providing the same Vattelian definition without citing Vattel, and not in any way referring to the English common law as a source for the definition of a “natural born Citizen,” stated: “The Constitution does not in words say who shall be natural-born citizens. Resort must be had elsewhere to ascertain that. At common law, with the nomenclature of which the framers of the Constitution were familiar, it was never doubted that all children born in a country of parents who were its citizens became themselves, upon their birth, citizens also. These were natives or natural-born citizens, as distinguished from aliens or foreigners. Some authorities go further and include as citizens children born within the jurisdiction without reference to the citizenship of their parents. As to this class there have been doubts, but never as to the first. For the purposes of this case, it is not necessary to solve these doubts. It is sufficient, for everything we have now to consider, that all children, born of citizen parents within the jurisdiction, are themselves citizens.” Id., 169 U.S. at 679-80 (emphasis supplied). Minor did not cite Vattel but as can be seen the Court’s definition of a “citizen” and a “natural-born citizen” are taken directly out of Vattel’s The Law of Nations, Section 212. Elk v. Wilkins, 112 U.S. 94 (1884): This was a decision of the U.S. Supreme Court written by Justice Gray. Justice Gray stated: “Indians born within the territorial limits of the United States, members of, and owing immediate allegiance to, one of the Indian tribes, (an alien though dependent power,) although in a geographical sense born in the United States, are no more 'born in the United States and subject to the jurisdiction thereof,' within the meaning of the first section of the fourteenth amendment, than the children of subjects of any foreign government born within the domain of that government, or the children born within the United States, of ambassadors or other public ministers of foreign nations.” Hence, the Court rejected mere territorial jurisdiction (e.g., a child born on U.S. soil to alien parents) and rather required complete, political jurisdiction (e.g., a child born on U.S. soil to U.S. citizen parents) in order for a child to be entitled to birthright citizenship. This meant being born with full and complete jurisdiction in the United States and not being born with a qualified or partial jurisdiction such as arises when a person is born with an allegiance to a nation other than the United States which occurs by being born in the United States to one or two alien parents. This definition of a “natural born Citizen” was also confirmed by Rep. John Bingham. In the House of Representatives on March 9, 1866, when commenting on the Civil Rights Act of 1866, which was the precursor to the 14th Amendment, he confirmed Vattel’s definition as the standard for defining a “natural born Citizen” when he proclaimed: "[I] find no fault with the introductory clause, which is simply declaratory of what is written in the Constitution, that every human being born within the jurisdiction of the United States of parents not owing allegiance to any foreign sovereignty is, in the language of your Constitution itself, a natural born citizen. . . . ” John A. Bingham, (R-Ohio) US Congressman, March 9, 1866 Cong. Globe, 39th, 1st Sess., 1291 (1866), Sec. 1992 of U.S. Revised Statutes (1866). So as we can see, the original and only definition of a “natural born Citizen” includes all those who were not born with any foreign allegiance and excludes all those born with foreign allegiance. In order to acquire this birth status, the definition of a “natural born Citizen” contains as necessary elements both U.S. place of birth (jus soli) and U.S. parentage (jus sanguinis), for birth allegiance and citizenship may attach to a child from either one of these sources. One “birther” argument focuses on Obama’s alleged place of birth. These concerned Americans want nothing more than to be assured that their President and Commander in Chief was born in Hawaii as he says he was. There exists a substantial amount of evidence that gives them enough concern to want to know for sure that their putative President was in fact born in Hawaii. This evidence may be reviewed at, A Catalog of Evidence - Concerned Americans Have Good Reason to Doubt that Putative President Obama Was Born in Hawaii , http://puzo1.blogspot.com/2010/05/catalog-of-evidence-concerned-americans.html . Despite this great amount of evidence, Obama to this day refuses to release to the public a valid copy of his long-form, hospital generated birth certificate which would but an end to the place of birth controversy. Nor is he willing to allow his alleged birth hospital, Kapi’olani Maternity & Gynecological Hospital (now called Kapi’olani Medical Center for Women and Children) to publicly confirm that he was born there. Another “birther” argument focuses on Obama’s parentage. They argue that Obama fails to meet the “natural born Citizen” eligibility test because when he was born in 1961 (wherever that may be), he was not born to a United States citizen mother and father. At his birth, his mother was a United States citizen. But under the British Nationality Act of 1948, his father, who was born in the British colony of Kenya, was born a Citizen of the United Kingdom and Colonies (CUKC) which by descent under that same law made Obama himself a CUKC. Prior to Obama’s birth, Obama’s father neither intended to nor did he become a United States citizen. Being temporarily in the United States only for purpose of study and with the intent to return to Kenya, his father did not intend to nor did he become even a legal resident or immigrant to the United States. So under this 1948 statute, foreign allegiance attached to Obama at the moment of his birth. Our own laws recognized this foreign allegiance attaching to Obama. The point is clearly made when we consider that while John McCain was born in Panama to U.S. citizen parents, our Senate still considered him a “natural born Citizen.” This recognition by our own Senate of a foreign-born child as a “natural born Citizen” shows the power and influence that the citizenship of parents has in matters of citizenship and naturalization, creating enough allegiance to the United States to trust that person to be President and Commander in Chief of the Military even though born in a foreign country. Obama may be a born “naturalized citizen of the United States” under the 14th Amendment or a Congressional Act (if he was born in Hawaii). But he is not an Article II "natural born Citizen of the United States," for upon Obama's birth his father was a British subject and Obama himself by descent was also the same. Hence, Obama was born subject to a foreign power and with foreign allegiance. Obama lacks the birth status of natural sole and absolute allegiance and loyalty to the United States which only the President and Commander in Chief of the Military and Vice President must have at the time of birth. Being born subject to a foreign power, he lacks sole allegiance and unity of citizenship to the United States from the time of birth which assures that required degree of natural sole and absolute birth allegiance and loyalty to the United States from birth, a trait that is constitutionally indispensable in a President and Commander in Chief of the Military. Like a naturalized citizen, who despite taking an oath later in life to having sole allegiance to the United States cannot be President because of being born subject to a foreign power, Obama too cannot be President. The “natural born Citizen” clause serves a critical purpose today as it always has and must be enforced in every Presidential election. The President has immense power, both civil and military. The clause assures the American people that their President does not have any allegiances, loyalties, or attachment to any nation other than the United States. In our nuclear world, it will avoid having a President who may hesitate to act quickly and decisively in a moment of crisis due to some internal psychological conflict of allegiance or loyalty. It will avoid any foreign nation expecting and pressuring the President to act in their best interest instead of that of America. The clause also gives the American people the best chance that they will not be attacked or have their fundamental form of government altered from within the Office of President. Knowing the President is a “natural born Citizen,” the American people will trust their President with their lives. Finally, such a President can expect that the military will give him or her full trust and obedience. Read more at Why the “Natural Born Citizen” Clause of Our Constitution Is Important and Worth Preserving , http://puzo1.blogspot.com/2009/08/why-natural-born-citizen-clause-is.html . What the Independent.ie “news” organization fails to understand is that a majority of Americans are “birthers,” concerned about any one of these issues or all of them. Looking for answers to these legitimate questions can hardly qualify these concerned Americans as “radicals.” Rather, these are concerns that are important to many Americans, and this news organization should study and understand them before publishing such reckless and irresponsible statements about a majority of Americans. 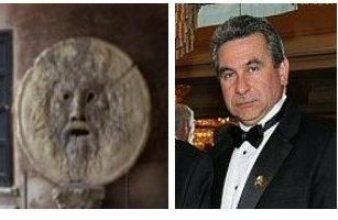 Atty Mario Apuzzo & CDR Charles Kerchner (Ret) were guests on the Howie Mandel Radio Show hosted by Jim 'Howie' Mandel - Tues 15 March 2011, 10:00 p.m. ET. The subject will be the Obama eligibility issue and states' rights issues in trying to pass Presidential Eligibility Assurance Acts and get them into effect before the 2012 primary and general election cycle. The Republican Party leadership in the State of GA is blocking the passage of a Presidential Eligibility Act to properly vet candidates in future elections for compliance to Article II, Section 1, the presidential eligibility clause. Why are the Republican leaders of the GA House of Reps blocking a simple law to support and defend a part of our U.S. Constitution given that Congress, the Courts, and the media have done nothing? Why are all our institutions throwing the Constitution under the bus and continuing to cover up for Obama's refusal to prove his true legal citizenship identity beyond reason doubt which he has not done to 2/3 of the American people. That issue and more will be discussed. Tune in. Patriot Action Alert - Contact the GA Speaker of the House David Ralston and House Majority Leader Larry O' Neal and Urge them to 100% Support the GA HB401 and a 2012 Presidential Election Cycle Effective Date and Not to Change the Bill to a 2013 Post-Election Cycle Date. It is a crucial time for states rights efforts to gain back control of our out-of-control federal government and Congress and those who are ignoring our U.S. Constitution and usurping power they are not entitled to or not eligible for. GA HB401 the Presidential Eligibility Assurance Act is being stalled in committee in the GA House of Reps by lack of full backing by the GA Speaker of the House David Ralston, a Republican, and Republican Majority Leader Larry O'Neal. It will die in the relevant GA house committee this Wednesday or will be modified and moved out with an effective date of 2013, after the next election giving Obama another pass at compliance with Article II Section 1 of our U.S. Constitution, i.e., of having to prove he is a "natural born Citizen of the United States". Contact the Speaker of the GA House of Reps David Ralston and Majority Leader Larry O'Neal and tell them to stop their recalcitrant behavior with the stalling and delaying on the HB401 the Presidential Eligibility Assurance Act put forward by GA Reps Mark Hatfield and Sean Jerguson. Tell the GA house speaker the bill must be moved out of the relevant committee now and passed this legislative session with an effective date of this year to allow it be in effect for the 2012 presidential election cycle ... NOT 2013 as the GA speaker is twisting arms to do. Call or FAX him. Even better if you live near the GA House Capitol building go visit him personally on Monday or Tuesday and tell him how important it is that this bill HB401 be moved out of committee and passed and be in effect for the coming presidential election cycle in 2012. We cannot allow the usurper in chief Barack Hussein Obama to get another pass in the proper vetting of his original long form birth certificate records and proving to the states election officers his true legal birth identity and citizenship status in the 2012 election cycle, since he won't do it now. Internet images of questionable authenticity short-form computer print outs don't cut it in the age of photoshop and rampant birth document fraud. No controlling legal authority or state election official in any state has ever seen the alleged paper document used to make that online image for Obama's Certification of Live Birth. Only certified copies of the original long form birth certificate showing the name of the hospital of birth, attending doctor, midwife if applicable, and/or witnesses to the birth event with signatures of same will do. And that type certified paper document must be presented to each and every state's Secretary of State to prove the candidate's eligibility under the Constitution. Internet images prove nothing. Several GA reps are taking steps to make this happen. But the GA Speaker of the House David Ralston is being recalcitrant about this effort for reasons unknown. So contact him and let him know "We the People" want him to support and protect the U.S. Constitution PER HIS OATH and that he should get 100% behind GA HB401 and move it into law ASAP. Also contact the Gov of GA and tell him to get behind this bill and to openly call for its adoption in committee and movement to the full GA house for passing and adoption this year to be effective for the 2012 election cycle. Help protect our liberty and our Constitution. Make you voices heard in GA now! Obama Ineligible! 14 Mar 2011 issue Washington Times National Weekly edition - page 5. Citizen maybe, but NOT a "natural born Citizen" of the United States. Article II, Section 1 of the U.S. Constitution tells us that the Electoral College is the mechanism used to elect the President. 3 U.S.C. Sec. 4. Article II, Section 1 also tells us how the Electoral College is filled. It says that the states shall appoint the electors who will make up the Electoral College, determining the manner of electing them and the quantity to be elected. The rest of Article II, Section 1 was changed by the Twelfth Amendment which now prescribes how the voting is done, how the votes are tallied and transmitted to Congress, and how Congress confirms those votes and declares who shall be President. Further state authority over federal elections is found in Article I, Section 4, Clause 1, which delegates to the state legislatures the initial authority for the "Times, Places and Manner" of elections to Congress, with Congress having residual authority to make such regulations. Hence, the Constitution gives to the states the authority over federal elections and specifically to appoint its electors and decide how their votes are processed for the purpose of determining who shall be President. There is therefore no question that states have the power to run their own presidential and vice-presidential elections. Storer v. Brown, 415 U.S. 724, 730 (1974) (the Election Clause, Article I, Section 4, Clause 1 which applies to Congress was intended to grant states authority to protect the integrity and regularity of the election process by regulating election procedure). As part of that process, states must also have the authority over who shall be placed on any ballot to run for president and vice-president. “States, through the Elections Clause, exercise some regulatory authority over federal elections because "as a practical matter, there must be a substantial regulation of elections if they are to be fair and honest and if some sort of order, rather than chaos, is to accompany the democratic processes." Storer, 415 U.S. at 730. This authority, however, is not unlimited. Any regulation of time, place, and manner must not violate other portions of the Constitution. See, e.g., Smith v. Allwright, 321 U.S. 649, 661-62, 64 S. Ct. 757, 88 L. Ed. 987 (1944) ("Texas is free to conduct her elections and limit her electorate as she may deem wise, save only as her action may be affected by the prohibitions of the United States Constitution . . . ."). In addition, "while states enjoy a wide latitude in regulating elections and in controlling ballot content and ballot access, they must exercise this power in a reasonable, nondiscriminatory, politically neutral fashion." Miller v. Moore, 169 F.3d 1119, 1125 (8th Cir. 1999).” Id. at 590. Discussing the qualification clause for Representatives and Senators found at Article I, Section 3, Clause 3 and Article I, Section 2, Clause 2, respectively, in U.S. Term Limits v. Thornton, 514 U.S. 779 (1995), the U.S. Supreme Court stated that "the text and structure of the Constitution, the relevant historical materials, and, most importantly, the 'basic principles of our democratic system' all demonstrate that the Qualifications Clauses were intended to preclude the States from exercising any such power and to fix as exclusive the qualifications in the Constitution." The Court said that a state has no authority to change, add to, or diminish the age, citizenship, and residency requirements for members of Congress specified in their Qualification Clause found at Article I, Section 2, Clause 2 and Article I, Section 3, Clause 3. See also Powell v. McCormack, 395 U.S. 486 (1969) (relying on historical analysis and democratic principles held that the qualifications for Congress are “fixed” in the Constitution and cannot be supplemented by Congress). As Congress is limited in changing, adding to, or diminishing constitutional eligibility requirements for members of Congress, so are the states. See Texas Democratic Party v. Benkiser, 459 F.3d 582 (5th Cir. 2006) (same). The same reasoning would necessarily apply to the Presidential eligibility clause found at Article II, Section 1, Clause 5. Under well-established precedent, this qualification clause is exclusive and cannot be changed by a state in definition or application in a way that is contrary to the Constitution. Id. at 589. So we can see that states are not allowed to make their own definitions of eligibility for public office which violate the Constitution. A state can only apply that definition for eligibility as is prescribed by the applicable qualification clause of the Constitution. “If a statute is unconstitutional as applied, the State may continue to enforce the statute in different circumstances where it is not unconstitutional, but if a statute is unconstitutional on its face, the State may not enforce the statute under any circumstances.” Women's Medical Professional Corp. v. Voinovich, 130 F.3d 187, 193 (6th Cir. 1997). In deciding who shall get on its election ballot, a state has to also make sure that it also complies with its own state statutes and laws. Texas Democratic Party, 459 F.3d at 592. Mr. Maskell states in his CRS memo that there is no “formal administrative or legal requirement or oversight at the federal level, or specific state requirement to produce a birth certificate for ballot placement.” Hence, several states are now working on legislation the purpose of which is to make sure that presidential candidates who would win an election and assume the Office of President and Vice-President are eligible to hold those offices under Article II, Section 1, Clause 5. As we know, under the “natural born Citizen” clause, no one who is not a “natural born Citizen", 35 years old, and a 14-year resident may be President. Since the federal government does not require it, the states should demand to see documentary evidence showing that a candidate who intends not only to run for such office but also to assume the powers of that office should he or she win the election meets those three requirements and is therefore qualified according to the Constitution. On being a “natural born Citizen” and for those candidates who may have been born in a hospital, that would include, but not be limited to, the candidate producing a certified true copy of a valid long-form birth certificate which contains corroborating information which will enable the state to reasonably conclude that the candidate was born in the specified place and time. Such a requirement is within its powers to protect the integrity and regularity of the election. Notwithstanding whatever powers the states may have retained under the Tenth Amendment, states cannot alter or add to the meaning of a “natural born Citizen.” As U.S. Term Limits explained in the context of qualifications for Congress, “[f]irst, we conclude that the power to add qualifications is not within the ‘original powers’ of the States, and thus is not reserved to the States by the Tenth Amendment. Second, even if States possessed some original power in this area, we conclude that the Framers intended  the Constitution to be the exclusive source of qualifications for Members of Congress, and that the Framers thereby "divested" States of any power to add qualifications. Id. at 800-01. Indeed, states cannot prescribe a presidential eligibility requirement that goes over and above that included in Article II, Section 1, Clause 5 itself. To do so would be unconstitutional. United States Term Limits, 514 U.S. at 807. (2) the Founders’ and Framers’ intent in inserting the “natural born Citizen” clause in the Constitution which was for the safety and preservation of the nation by excluding foreign allegiance, influence, and attachment from the Office of President and Commander in Chief of the Military. On July 25, 1787, John Jay wrote a letter to General Washington, who was acting as president of the Constitutional Convention, stating: "Permit me to hint, whether it would not be wise & seasonable to provide a strong check to the admission of Foreigners into the administration of our national Government; and to declare expressly that the Command in chief of the american army shall not be given to, nor devolve on, any but a natural born Citizen" (“born” underlined in the original). http://rs6.loc.gov/cgi-bin/query/r?ammem/hlaw:@field%28DOCID+@lit%28fr00379%29%29 . On September 2, 1787, George Washington wrote a letter to John Jay the last line of which read: "I thank you for the hints contained in your letter." http://www.consource.org/index.asp?bid=582&fid=600&documentid=71483 . On September 4, 1787, about 6 weeks after Jay's letter and just 2 days after Washington wrote back to Jay, the "natural born Citizen" requirement appeared in the draft of the Constitution. The proposal passed unanimously without debate which does not mean that the proposal was not discussed, for the convention meetings were conducted in secrecy. 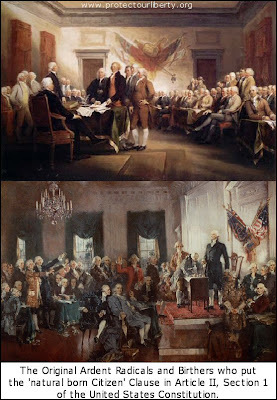 From the chronology of these events, we can conclude that it was probably Jay’s letter to Washington and his concern about foreign influence infecting the office of the Commander in Chief which motivated the Founders and Framers to insert the clause as part of the eligibility requirements to be President and Commander in Chief. Inglis v. Sailors’ Snug Harbor, 28 U.S. 99, 3 Pet. 99, 7 L.Ed. 617 (1830): The majority, which included Chief Justice John Marshall, cited Vattel on the right of election to change one’s allegiance and thus citizenship in the context of the new nation being formed after revolution. The Court found on principles consistent with Vattel’s jus sanguinis and not on the English common law rule of jus soli, that simply being born in New York, after July 4, 1776 and before September 15, 1776, when the British took possession of New York, was not sufficient to establish one’s status as an American citizen, for a child of minor years is incapacitated from making any citizenship election but rather followed the citizenship held or chosen by the father. On the contrary, relying upon principles of the English common law, Justice Johnson and Justice Story, who wrote separate minority concurring opinions, would have found the child born in New York during the same time period a citizen of the State of New York or American citizen, respectively, regardless of the citizenship of his parents. Id. 136 and 164. This case shows what the majority rule was on citizenship and that it followed the Vattelian doctrine that a child when born took on the national character of his or her father (meaning father and mother under the doctrine of merger of the wife’s citizenship into the husband) and did not acquire his or her citizenship from the territory in which he or she was born. Minor v. Happersett, 88 U.S. 162, 167-68 (1875): Providing the same Vattelian definition without citing Vattel, and not in any way referring to the English common law, stated: “The Constitution does not in words say who shall be natural-born citizens. Resort must be had elsewhere to ascertain that. At common law, with the nomenclature of which the framers of the Constitution were familiar, it was never doubted that all children born in a country of parents who were its citizens became themselves, upon their birth, citizens also. These were natives or natural-born citizens, as distinguished from aliens or foreigners. Some authorities go further and include as citizens children born within the jurisdiction without reference to the citizenship of their parents. As to this class there have been doubts, but never as to the first. For the purposes of this case, it is not necessary to solve these doubts. It is sufficient, for everything we have now to consider, that all children, born of citizen parents within the jurisdiction, are themselves citizens.” Id., 169 U.S. at 679-80 (emphasis supplied). Minor did not cite Vattel but as can be seen the Court’s definition of a “citizen” and a “natural-born citizen” are taken directly out of Vattel’s The Law of Nations, Section 212. Hence, when Minor said “common law,” it was not referring to the English common law but rather to American common law which had its basis in citizenship matters in natural law and the law of nations. Minor also distinguished between “natural-born citizens” and “citizens.” When Minor spoke of the common law, it referred to the “citizens” and the “natives or natural-born citizens,” explaining that there never has been any doubts that the children born in the country to “citizens” were the “natives or natural-born citizens.” Since Minor was being asked to apply the 14th Amendment, it then applied the common law rule to the 14th Amendment which only speaks of “citizens” and not “natives or natural-born citizens.” It then concluded that any person who is a “natural-born citizen” is necessarily also a “citizen.” The Court, was not, however, willing to go as far as to say that a child born in the country to parents who were not U.S. citizens was even a “citizen” under the 14th Amendment, let alone a “natural-born citizen.” The Court added that “there have been doubts” as to whether that child is even a “citizen.” Having decided that such a child is not a “natural-born citizen,” it left the question of whether such a child is a “citizen of the United States” under the 14th Amendment to another day. So Minor told us that a child born in the U.S. to non-U.S. citizen parents is not a “natural-born citizen” and that it was not necessary for it to decide whether that child was a “citizen” under the 14th Amendment because the plaintiff was born in the country to U.S. citizen parents, making her an Article II “natural-born citizen.” What is important about Minor is that the U.S. Supreme Court told us that the definition of a "natural born Citizen" is not contained in the Constitution, including the 14th Amendment, nor in any Act of Congress. Rather, Minor defined a "natural born Citizen" under American common law which as we can see was based on natural law and the law of nations as presented by Vattel in Sections 212-217 of The Law of Nations and not under the English common law. It also told us by implication that a child born in the country to parents who are not U.S. citizens is not a “natural-born citizen” and expressly told us that “there have been doubts” as to whether such a child is even a “citizen” under the 14th Amendment. If “there have been doubts” as to whether such a child was a “citizen” under the 14th Amendment, then given that pursuant to the grandfather clause of Article II, Section 1, Clause 5 the standard to be a “natural born citizen” was higher than that to be just a “citizen,” there is no way that such a child could be a “natural-born citizen.” After all, if one cannot satisfy the requirements to be a “citizen,” one surely cannot satisfy the requirements to be a “natural-born citizen." Perkins v. Elg, 307 U.S. 325 (1939): Other than Minor v. Happersett, Perkins is the only Supreme Court decision to declare someone a “natural born Citizen.” The person was born in the United States to a naturalized U.S. citizen father and citizen mother through derivative citizenship. The last word on the meaning of a “natural born Citizen” was provided by Minor v. Happersett. It is important to note that the Court decided Minor after the Fourteenth Amendment was passed which tells us that the Court gave us that definition knowing that the Fourteenth Amendment defined a “citizen of the United States” and not a “natural born Citizen.” This same definition had been stated by Rep. John Bingham, who in the House on March 9, 1866, in commenting on the Civil Rights Act of 1866 which was the precursor to the Fourteenth Amendment, stated Vattel’s definition thus: "[I] find no fault with the introductory clause, which is simply declaratory of what is written in the Constitution, that every human being born within the jurisdiction of the United States of parents not owing allegiance to any foreign sovereignty is, in the language of your Constitution itself, a natural born citizen. . . . ” John A. Bingham, (R-Ohio) US Congressman, March 9, 1866 Cong. Globe, 39th, 1st Sess., 1291 (1866), Sec. 1992 of U.S. Revised Statutes (1866). As we have seen, this definition was confirmed in U.S. v. Wong Kim Ark. Our Supreme Court has never changed this American common law definition and it prevails today. For more information on the meaning of a “natural born Citizen,” please see the many essays on its meaning at http://puzo1.blogspot.com and at www.protectourliberty.org. While the Constitution does not define a “natural born Citizen,” the states can apply the definition of the “natural born Citizen” clause in keeping with the sources stated herein. What is imperative is that the states apply the “natural born Citizen” clause as intended by the Constitution. See Matter of Kryzan v. New York State Bd. of Elections, 2008 NY Slip Op 8354, 55 A.D.3d 1217, 865 N.Y.S.2d 793, 2008 N.Y. App. Div. LEXIS 8129 (the only requirement of New York’s election law that the candidate be a resident of the State did not violate the Constitution’s Congressional Qualification Clause). Applying the “natural born Citizen” clause in keeping with the Constitution will not violate the fundamental principle identified in Powell that in our representative form of government “the people should choose whom they please to govern them." Powell, 395 U.S. at 547. Applying the “natural born Citizen” clause pursuant to U.S. Supreme Court precedent and other sources herein identified does not create an absolute bar to any one person or a class thereof being able to be President any more than the Constitution itself requires. The 2008 presidential election presented us with a situation in which putative President Obama has assumed and currently holds the great and singular civil and military powers of the President and Commander in Chief without proper vetting by our media and political institutions. To this date, even though there are millions of concerned Americans asking that Mr. Obama release to the public a certified copy of his long-form, hospital generated birth certificate which would conclusively prove that he was born in Hawaii, he just refuses to do so. These Americans are not satisfied with the electronic image of an alleged 2007 short-form Certification of Live Birth that Obama posted on the internet in 2008. 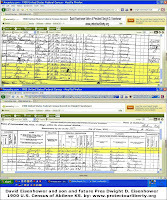 Apart from the question of whether this computer image is authentic, this computer image does not contain the name of the birth hospital, the name of the delivery doctor, and names and signatures of persons who witnessed the birth in Hawaii. The State of Hawaii and the alleged birth hospital, Kapi’olani Medical Center for Women & Children (formerly known as Kapi’olani Maternity & Gynecological Hospital and which has neither affirmed nor denied Obama’s birth there), have also announced publicly that they cannot release Obama’s long-form, hospital generated birth certificate because of federal and state privacy laws and Obama has not given his consent to the release. How can our nation have gotten to the point where a person has been allowed to assume these great powers without having revealed to the people he is supposed to serve the necessary documents which would conclusively show that he was in fact born in Hawaii as he claims? How can a presidential candidate have any reasonable expectation of privacy in his or her birth certificate if the Constitution demands that the President be a “natural born Citizen?” Moreover, Mr. Obama was born a British subject/citizen and a "citizen of the United States" if born in Hawaii. Neither the federal authorities nor the states questioned whether a person born subject to a foreign allegiance, influence, and power can be an Article II "natural born Citizen." The states which have a constitutional duty to protect their citizens simply cannot allow a repeat of such a scenario to occur in the 2012 presidential election. If any candidate feels damaged by a state’s application of the “natural born Citizen" clause, let that candidate file an action against the state and let the courts decide the issue. A court having to decide the issue will have to examine as the state would have done in applying the “natural born Citizen” clause the text and structure of the Constitution, the Founders’ and Framers’ intent in inserting the “natural born Citizen” clause in the Constitution, relevant historical materials, and case precedent of the U.S. Supreme Court.